Rangers fans, by nature, aren’t a particularly optimistic bunch. There’s a good reason for this: They’ve won the Stanley Cup exactly once in the past 73 years, have been to the Finals once in 34 years, and went nearly a decade without making the playoffs not too long ago. Rangers fans may not expect the painful worst the way that, say, Red Sox fans did for generations. But it takes a lot to convince them that good things could be on the horizon. The beginning of last season was one of those rare moments of optimism. It didn’t last long. After unexpectedly finishing the 2011-12 season with the Eastern Conference’s best record, advancing to the conference finals, and acquiring Rick Nash in a blockbuster trade in the off-season, it appeared as though the Rangers were one of the NHL’s elite teams — one of the few with a legitimate chance to win the Stanley Cup. But as the season played out, 2012 began to feel like overachievement: The Rangers, for a variety of reasons, slipped back into mediocrity, clinching a playoff spot in the season’s final week and losing in the second round of the playoffs to Boston. Much of that team, which finished sixth in the East, remains. Unlike the last couple of off-seasons, there was no blockbuster acquisition this summer, and though there was some roster turnover, the core of that team is still in place (or at least will be once everyone gets healthy). So what to make of this group? That largely depends on how big an impact you think new head coach Alain Vigneault will have. You’ll recall that the Rangers fired the prickly John Tortorella after last season; Tortorella said in a recent interview that he was told by GM Glen Sather that he’d lost the team. But there was also the question of whether his system was quite right. Tortorella’s Rangers teams became known for a blue-collar style of hockey in which shot-blocking and gritty play along the boards were valued. 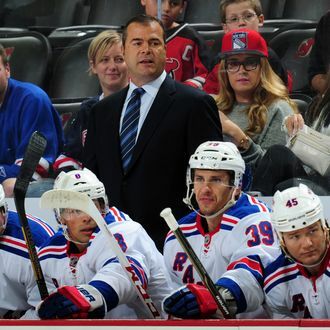 But in Vigneault, they now have a coach with a more offensive-minded system. Under Tortorella, the Rangers had a handful of talented offensive players but last year especially struggled to score goals. The thinking goes that Vigneault is the kind of coach this team needs — that he’ll squeeze all the offense he can out of them without sacrificing too much defense and overall gritty play. On paper, it makes a lot of sense (though don’t forget that the Rangers picked Vigneault to succeed Tortorella largely because he was simply the safest available candidate). But lots of things have made sense on paper for this franchise that ultimately didn’t work out on the ice. By the end of last season, it had become clear that the 2013 Rangers were no real threat to win the Cup. But was that an example of underachievement? Or were those the true Rangers — a decent team whose season only seemed disappointing because they had indeed overachieved the year before? In theory, this team’s window of opportunity is still open: They have perhaps the best goalie in the world, three excellent shutdown defensemen, and a handful of good-to-great forwards, if not great offensive depth. Maybe Rich Nash will flourish under Vigneault. Maybe Brad Richards, whose relationship with Tortorella had soured, will have a bounce-back season (even if he might be bought out at the end of it anyway). And maybe a fresh coaching staff will mean the power play will be something better than awful. It’s not inconceivable that this Rangers team is for real — there’s a lot of talent on the roster — but this year they’ll need to prove it before anyone can dream of anything bigger than a respectable playoff seed and an exit in the second round. (For what it’s worth, we have the Rangers finishing second in the new Metropolitan Division.) The preseason can only tell you so much, so we’ll begin to really learn about Vigneault’s Rangers beginning tonight, when they open their season against Phoenix. Vigneault’s preseason slogan was “Clean Slate. Grab It!” But while a new coach means a fresh start, it doesn’t necessarily mean a different result.